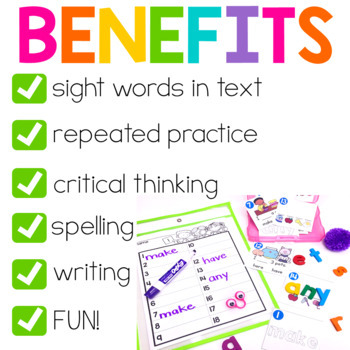 If you teach young readers, you know teaching sight words is SO important! I wanted to create a BRAND NEW interactive sight word activity that would engage my most active learners and provide lots of opportunities for practice! I wanted something that kids would LOVE and would be very easy for teachers to prep and use! 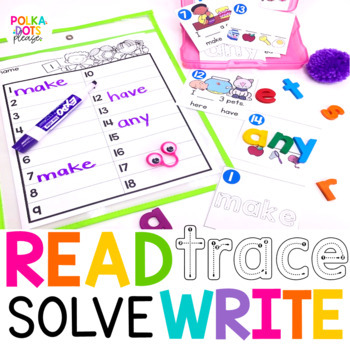 Read, Trace, Write, Solve is a sight word activity that allows children the opportunity to practice every sight word 4 different ways! Every word comes with 3 different practice cards so students can read and trace (or air write) the word, read the word in a sentence, and solve the word with a puzzle. Children write each word 3 times, but it never seems boring because the cards are so FUN! You can play this game with your whole class or with a small group. The cards can be hung around the room so children can walk as they play or you can use the cards at a center. Just print and cut the cards before you play! This product includes 4 sets of cards with 6 words for each set (75 total cards), student recording page, answer keys for each set, Mystery Code page, assessment page, and teacher sample cards. Click on the preview and the video preview to learn more! The preview includes a FREE sample of cards to try!